Happy February! How bizarre is the weather where you are? Last week it was subzero temps that had us lower in degrees than Antartica (yes, really), yesterday it was a record high that let me jog in shorts, and tomorrow? Ice storm. Alrighty then. So, if the weather's got your head spinning, how's the writing going? Feel free to dish. Thanks to Alex J. Cavanaugh for awesome ninja skills on this wonderful writer's platform along with his merry band of co-hosts: Raimey Gallant, Natalie Aguirre, CV Grehan, and Michelle Wallace! I can find thirty different ways to avoid unpleasant tasks in a heartbeat. Don't want to make a phone call? Sorry, time to clean the litter box. (Hmm, that seems a little backwards, but I'm an odd bird.) Need a reason to avoid the writing desk? Oh, I've got a million of those, including fatigue, shopping, kids wanting to come home sick, fighting cats that need separating, housework, and scavenger hunts for lost items. It's horrifying amazing the amount of crap dearly beloved keepsakes I can cram into the storage areas of this house. Send Maria Kondo, stat! Here's our neighborhood friend, Foxy, a beautiful red critter that's been visiting for a several weeks now. He (or she) is gorgeous. Noche and a harbor seal, holding paws. Awww. Who says stuffed animals are just for kids? Have you ever seen a kid whose adult teeth come in behind their baby teeth, sort of like a shark? Well, guess what? It can happen to kittens, too. Here's a shot of Noche with double upper fangs. I hope it's not hurting the little guy. It's the same on the other side of his mouth as well. I wonder which is the baby tooth and which is the adult? 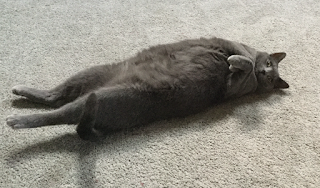 Our girl, Dove, impersonating a harp seal. She is the only cat I've ever met that actually allows belly rubs. I can even brush her tummy and she loves it! Can't leave out the fish friends. I can spot three here: two orange and one white. Do you take pet pictures or other wildlife? How crazy is the weather in your town? What does the vet say about the double fangs? Seriously, though. Every time I sit down to write, I think, I need to Maria Kondo my entire house!! STOP!! Just write. I love the fox. He/she is soooo cute. Seals and sharks - your cats are blending in with the fish. Same weather here! Subzero cold for a few days and now it's nice--but the cold is coming back, no worries about that! I laughed at procrastination being one of your 'creative' outlets. I need to start thinking of it that way! I wish that I took more pictures like you do. I never have gotten into it except for at important family gatherings. Maybe you'll inspire me to take some pictures of my sweet dog. You could compete with my daughter. She's procrastination personified! Love your pictures. And yes, I know of an adult who still had their baby teeth when their adult teeth were popping up. Weird, huh? I hear you on the procrastination front, especially making phone calls. I'm as close to a phone-phobe as anyone can be. Loved the fox picture. What a beauty. In Western Washington State, we've had some rare snow and ice, though nothing like the Arctic vortex the middle of the U.S. has been suffering under. I haven't left the house for the last two days, as the streets and sidewalks have been too icy for safe travel. Crazy weather for us. Thanks for sharing photos of your animal friends, domestic and otherwise. Happy writing in February! Love your procrastinating. Sounds like mine although I can't clean a litter box because I don't have a cat. We beat it out of Michigan for the gulf coast in between the Polar Vortex and being snowed in last week and this week's ice storm. Unfortunately, we have to go back next week. I hope Mother Nature doesn't have any more surprises for us. It's funny how many people are talking about the weather. It's crazy here for sure. 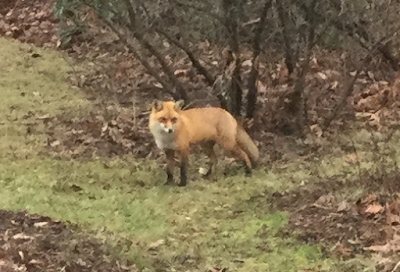 We have a red fox that has been visiting our neighborhood. One of our elderly neighbors claims it ate one of her cats. My dad used to have a three-legged fox that skulked around his cabin, we got a few pictures of him. We called him Michael J. Not because he had a disability, just because I was a kid and I thought it was funny. Love the first two items on your list. Very familiar. I don't do wildlife photography, but I admire people who do. Your fox picture is perfect! I love animal photography. When I lived by a pond, I took so many photos and films of the geese and their goslings, and the ducks. I've also taken a lot of photos of cats in Israel. They're everywhere there, so much so they've been called Israeli squirrels. I completely relate to #1 and #2, but Marie Kondo isn't coming anywhere near my house. She hates books and one cannot trust a person who hates books. Wildlife photography? Now that's just a calling from God, not to be ignored. I am loving that double fang photo - there has got to be a story lurking there! I've just added procrastination to my list of creative activities, because I, too, can procrastinate like nobody's business. Ha ha. The time you take for yourself when you absolutely shouldn't is the best. I still don't know why. 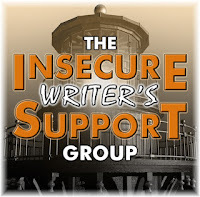 Happy IWSG Day! We have a fox family in our neighborhood, too. They’re beautiful even though the red fox are non-native, brought over by the English to hunt. I do like this question and learning about people’s other creative outlooks. LOL @ procrastination as a form of creativity. Also...me too. ;-) Hope your baby kitty is okay! Noche is gorgeous! 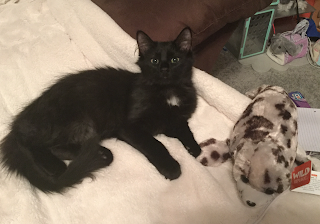 He looks like my Minnie--is Noche a Norwegian Forest kitty? As for Dove, wow, she's sure a fluffy one! The weather has been hectic! Temperatures at freezing or below (and we're in mid Texas! ), lots of fog, NO snow, some days are tolerable. This is really crazy. That cat-as-harp-seal photo is awesome. I love them all, but that one made me smile the most. My kitty Chloe does a great imitation of a harp seal pup when they're all fuzzy and white. Must try to get a photo. I'm jealous of your red fox! Would love to see one in the wild. Now that I know procrastinating and clutter hiding are creative talents, I feel so much better about myself. Thanks, Tamara! Does it still count if you don't hide the clutter? Our weather is always a crap shoot. I think West Virginia has hard time deciding whether it's a cold northern state or a warm southern state. Predictably, it could snow one day and be short-sleeve weather the next.